At the end of the first Gulf War I saw something that startled me and gave me pause. More than 20 years later I can still see the image in my mind, so vivid was the impression it made. It was June 8, 1991. America had just won a dazzling victory. We’d won a war in a hundred hours. Saddam Hussein had folded like a cheap suit and slunk out of Kuwait. The troops were coming home and the airwaves were full of joyous reunions. It was good. Then the startling thing: There was a huge, full-scale military parade down Pennsylvania Avenue in Washington—two miles of troops, tanks, helicopters, even missiles. They marched from the Capitol past the White House, where there was a reviewing stand full of dignitaries. An F-117 stealth fighter streamed overhead. 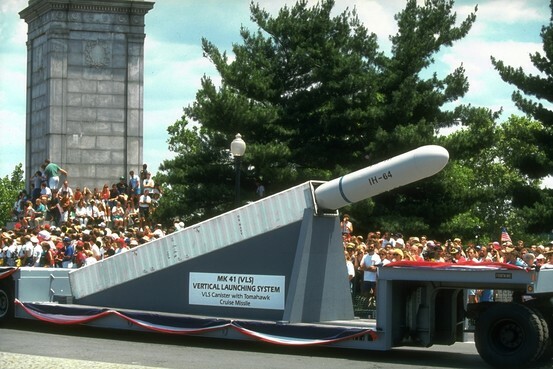 MK 41 (VLS Vertical Launching System) Navy Tomahawk Cruise missile rolling along on flatbed truck during Desert Storm gulf war victory parade on June 8, 1991. Disquieting was exactly the word. It was all such a rolling brag for a brief engagement we’d won with brains, guts and superior technology. More important, the size and nature of the parade seemed to suggest we were forgetting something: that war is a tragedy. People die in wars, the brave are sacrificed. War is sometimes necessary but always a mark of failure, the last bloody stop after breakdowns of diplomacy and judgment on all sides. War isn’t something you throw a fizzy party for while showing off your shining hardware. We had discovered how to brag. We had discovered how to beat our breasts with triumphalism and rub the world’s nose in our superior strength. We’d gotten through World Wars I and II barely saying a word. The parade struck me not as a thanksgiving (it’s over, there were limited casualties, we triumphed, thank God) but an assertion: “We’re No. 1.” But—more disquiet—if you’re really No. 1, and know it, you don’t have to say it like this, do you? The world in the 20th century liked the America that could do the job and the Americans who modestly did it. It wouldn’t feel so warmly about an America that made such a show of its prowess and power. Since 9/11 and the wars that followed, we have grown confused about power and its proper uses. America is not eager for huge new military-strategic adventures; America knows it itself has a lot of repair to do, especially of its economy. America has not grown isolationist and in fact has never been more global in its daily life—in its commerce and culture, in its very neighborhoods. But it has grown more modest and sober-minded about what it can and should do. At the same time, America has to stand, always, for what is right and decent in the world, or it will no longer be America. It needs to be able to do things only it can do at the moment, and do them bravely, successfully—and modestly. Which gets me to my dream for the schoolgirls. John McCain has it exactly right. (I don’t think I’ve ever written that sentence.) He told CNN that as soon as the U.S. learned that hundreds of children had been kidnapped and stolen away by a rabid band of terrorists in Nigeria, we should have used “every asset that we have—satellite, drones, any capabilities that we had to go after them.” He told the Daily Beast: “I certainly would send in U.S. troops to rescue them, in a New York minute I would, without permission of the host country.” He added, as only Sen. McCain would: “I wouldn’t be waiting for some kind of permission from some guy named Goodluck Jonathan. ” That’s Nigeria’s hapless president. Mr. McCain said that if he were president he would have moved already, and that is not to be doubted. There is nothing wrong with taking action—when possible—that is contained, discrete, swift, targeted, humanitarian and, not least, can be carried through successfully. And then shutting up about it. That might remind the world—and ourselves—who we are. And it might have very helpful effects down the road. “If we do that, the Americans may come.” Leave the monsters guessing. So, my dream: We go in, rescue the kids, get out, go home, and say nothing. Our troops would be happy with that: They like their jobs and like doing good, but the showbiz aspects that sometimes follow their actions only lead to distraction and discord. The White House would have to dummy up too, which would be hard for them. Staffers always want to make a president look good, and Obama staffers seem to think their primary purpose is to aggrandize the president. But there would be no network special with a breathless Brian Williams giving us the tick-tock on how it all went down and how the president kept his cool when all about him others were losing theirs. What happened would, of course, get around. The world would know in time. But we would say nothing, like dignified people who use their might not for praise or power, but to achieve a measure of decency in the world. You can’t do this kind of thing every time there is a need. But—if it’s not too late, if it hasn’t been made impossible by the passage of time—you could do it this time. But that’s not what the American people would think. They’d just think of the little girls. “Is it possible to go in there with a few hundred troops and save the girls and get out? Then do it!” And when word reached them that America had done it, they’d feel proud—we saved some children from the beasts who’d taken them. Americans would feel happy about what we’d done, and good about not bragging about it. Actually we would really be proud but not sickly proud, just morally satisfied. Like we used to when our heads were screwed on right.